As of 2019, Ridgefield has had 19 school superintendents. Only three were women, but among those was the very first superintendent: Charlotte Wakeman. After she left in 1921, it was 85 years before Ridgefield hired another woman for the job. An impressive person who was said to be close to six feet tall, “Biddy” Wakeman was remembered not only as a leader in bringing modern education to Ridgefield, but also as a disciplinarian and one who had a fondness for huge hats. A native of Copake, N.Y., Charlotte J. Wakeman was born in 1877 and grew up in Danbury. She came to Ridgefield in 1906 to be principal of and a teacher at the Center School on Bailey Avenue. In 1915, Ridgefield’s school system was considerably modernized with the addition of the Benjamin Franklin Grammar School, to which her classes were moved, and the opening of Alexander Hamilton High School at what had been the Center School. A year later, the district modernized even further with the creation of the job of school superintendent to oversee all the teachers and other staff. Wakeman held the position and at the same time continued to serve as a teacher. 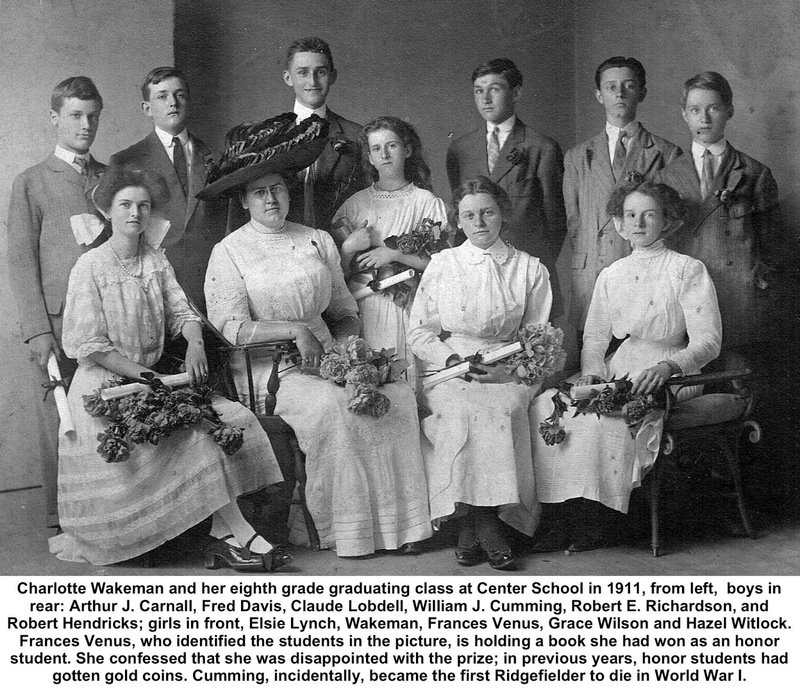 Wakeman was one of a number of Ridgefielders — educators, parents and “summer people” — who were leaders in modernizing the schools and moving the curriculum into the 20th Century. When she arrived here, the town had no high school. After Hamilton High opened, Wakeman then focused efforts on making it better. Even students chipped in: The girls in the home economics class under a Mrs. Myer created a “for a better high school” fund to raise money for the school. She was also known for her hats. During her career in Ridgefield, Wakeman was photographed several times wearing enormous hats — in one picture, the hat appears four times the width of her head, and nearly twice as high. They were no doubt a style of the day, but she would don them indoors, too, even for group photographs where everyone else was hatless. By 1921, Wakeman had had enough fighting and resigned. She took a job teaching English at the high school in Mount Vernon, N.Y., remaining there until her retirement in 1937. However, she continued to live in a small house on Main Street for some years, commuting to Mount Vernon, and maintained contact with her former staff members over the years. In 1937, Ridgefield teachers and friends honored Wakeman on her Mount Vernon retirement, holding a tea for her at the Book Barn on Wilton Road. The attendees included a who’s who of 20th Century Ridgefield educators: Mary Regan, Mary Moylan, Marie Kilcoyne, Mary and Elizabeth Boland, Ruth Wills, Eleanor Burdick, Josephine and Alice Hearst, Margaret and Agnes Carroll, Catherine O’Hearn, Grace White, Isabel O’Shea, Linda Davies, Francis J. Bassett, Charles D. Crouchley, Levio Zandri, and Clifford Holleran. 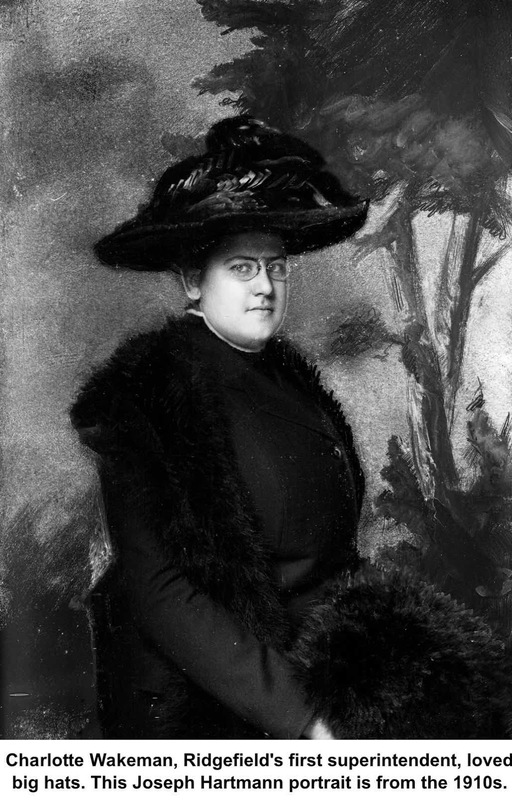 Although she held no academic degrees, Wakeman had studied at Columbia, Yale, Dartmouth, and New York University. She was also a founder of the American Woman’s Association, a once active suffragist organization. She died in 1969 at the age of 91. Perhaps she had taken off her hat.